I am creating a variety of NDVI for different periods in time, so per season for four years. I used the raster calculator on arcgis but i keep getting different max and min values. 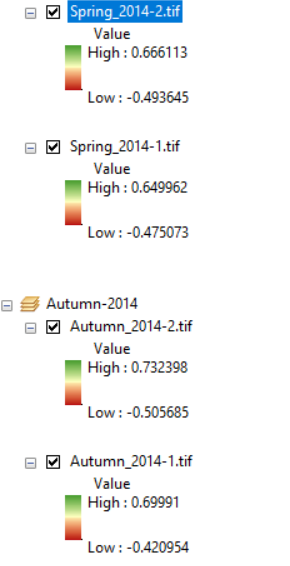 Do I need to make all the min-max values the same to be able to compare all the NDVI's and, if so, how do I do this? I tried using the min-max function in stretch in the symbology tab of layer properties but this just makes all the values alter that everything turns green. Depending on what you are trying to achieve, but if you simply want to compare the NDVI of an AOI during different periods then you don't need to make the min-max values the same. If you are trying to normalize the colors for the visualization, just make sure that you set the same break rules for the stretch in every raster. For visual comparison, you need to make all min-max the same, but not for analysis. In your case, the most simple workaround is to import the symbology of Automn 2014-2 for all your layer (because it contains both the min and the max values of all the rasters shown in your print screen). In order to compare them, you need to make sure the product you are using is comparable. You are not supposed to compare two different images if they haven't been properly corrected since the atmospheric variations may be the cause of some of the observed differences. As long you make sure all your NDVI images have been corrected, meaning you need to work with Surface Reflectance products, your values can be compared. It is completely normal to have different ranges and you of course have to symbolize them with the same palette and ranges. Not the answer you're looking for? Browse other questions tagged arcgis-desktop symbology spatial-analyst raster-calculator ndvi or ask your own question. Stretched raster symbology not working in ArcGIS for Desktop? Mapping habitat suitability using ArcGIS for Desktop? Why do UAV-derived NDVI values fall far outside -1 to 1 range after empirical line calibration? Updating min and max values with ArcPy on stretched raster symbology in ArcGIS Pro? Does Modis offer MultiYear statistics?